Renowned architect Douglas Cardinal, whose iconic buildings include the Canadian Museum of History in Ottawa and the National Museum of the American Indian in Washington, D.C., is a long-time admirer of Mahatma Gandhi. He pursued architectural studies at the University of British Columbia and received his architectural degree from the University of Texas at Austin. He became a forerunner of the philosophies of sustainability, green building, and ecologically designed community planning. Holder of innumerable awards, Cardinal has also received 18 honorary doctorates and is an Officer of the Order of Canada. 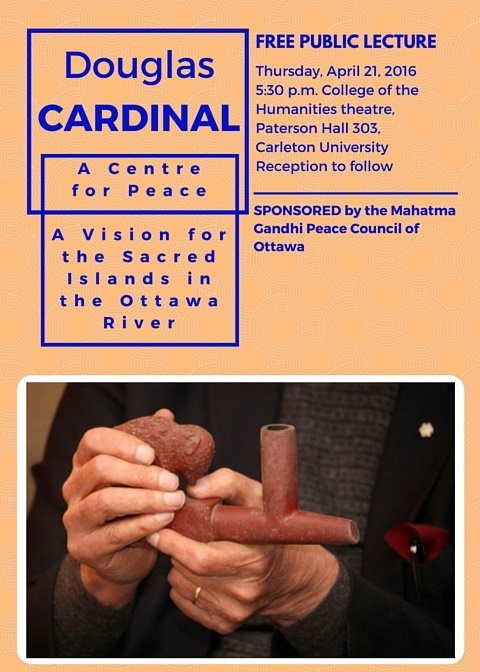 Cardinal’s presentation on April 21 concerns the islands at the heart of the capital city around the Chaudière Falls just upstream from Parliament. Carrying forward the vision of revered Algonquin Elder William Commanda, Cardinal has designed a centre for peace and a centre for Indigenous peoples that includes public parkland. All of these features acknowledges the status of the Falls and area around it, known in Indigenous languages as Asinabka and Akikodjiwan, as sacred site. Please join Douglas for an event at Carleton University on April 21.